People were shocked after they saw two big names in politics today strolling around Hong Kong city. Dressed up with crisp white Philippine national suit 'barong' tagalog is the 57-year-old Cresencio Extreme, drew excited crowds as he greeted the public. Cresencio is the man impersonating the Philippines President Rodrigo Duterte. 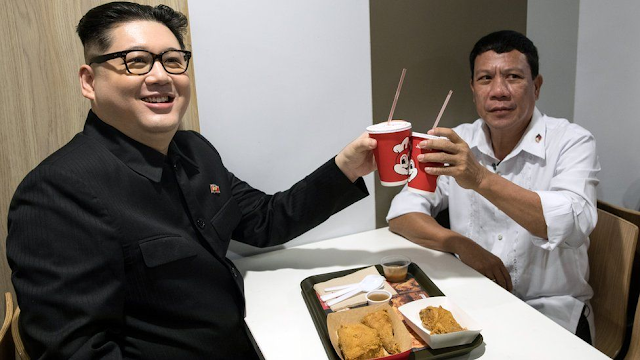 With him is the Hong Kong born Howard X, impersonator of the North Korean leader Kim Jong-un, everyone was surprised as the two spotted joining Sunday mass at St. Joseph's Church and eating the Jollibee's fried-chicken. The two caused a stir as supporters went to take photos with them. Cresencio stood and deliver President Duterte's kind of joke, "When I arrived at Hong Kong airport, I didn't see any beautiful ladies, but now I realise that Jollibee is where they are hidden."